Unfortunately, 2017 Ford Fiesta and 2017 Ford Fiesta owners are plagued by the same transmission problems that occurred in the 2011 to 2016 year models. Fortunately, we can help you determine whether or not your vehicle qualifies as a lemon under the California Lemon Law. sometimes will not move at all. Ford’s transmission system problems are causing vehicle owners to make multiple trips to Ford’s dealerships for repairs that are not solving the problem, if any repairs are even attempted. If you are having the same experience with your 2017 Ford Focus or 2017 Fiesta that many of our clients are having, be aware that some Ford dealerships are telling our clients that this is the “normal operation” of the transmission system and they are refusing to document our client’s complaints on a repair order; which is illegal. Every single time a consumer brings their vehicle to a dealership, the dealership is required to write up a repair order that lists the consumer’s complaints and must attempt to repair the problem(s). Then, by law, the dealership is required to give the consumer a repair invoice when the consumer picks up their vehicle. The repair invoice must state what, if any, repairs were made. If no repairs were made, the invoice must state that fact. In order to win a lemon law case we need evidence that our clients have attempted to have their faulty vehicles repaired. Our only evidence in a lemon law case is the repair order our clients receive when they drop their vehicle off at the dealership, and the repair invoice our clients receive when they pick their vehicle up from the dealership. If your Ford authorized repair facility is not recording each trip you make to the repair shop, and your complaint(s) about your vehicle, they are attempting to avoid potential lemon law liability. If your dealership offers to “buy back” your vehicle, what they are actually offering is a trade-in with a discount on the new vehicle. There are two problems with this scenario. One, the trade in value on the 2017 Ford Fiesta and 2017 Ford Focus is low because thousands of consumers are trying to trade them in to get rid of these problematic vehicles. Two, the new 2017 Ford Fiesta and 2017 Ford Focus have the same problems as previous models, so trading the vehicle in for another Fiesta or Focus is trading one problem for another. In most cases, a dealer “buy back” is not at all the same as a California Lemon Law repurchase. In a California Lemon Law repurchase, the consumer is entitled to recover their down payment, all of the monthly payments they have made, all out of pocket towing and rental car fees, and the manufacturer has to pay off the entire balance owed on the auto loan directly to the lender. The only deductions from the refund include the mileage offset (usage fee) which is placed at the mileage on the vehicle at the first transmission system repair, any aftermarket items, factory rebates, or negative equity. 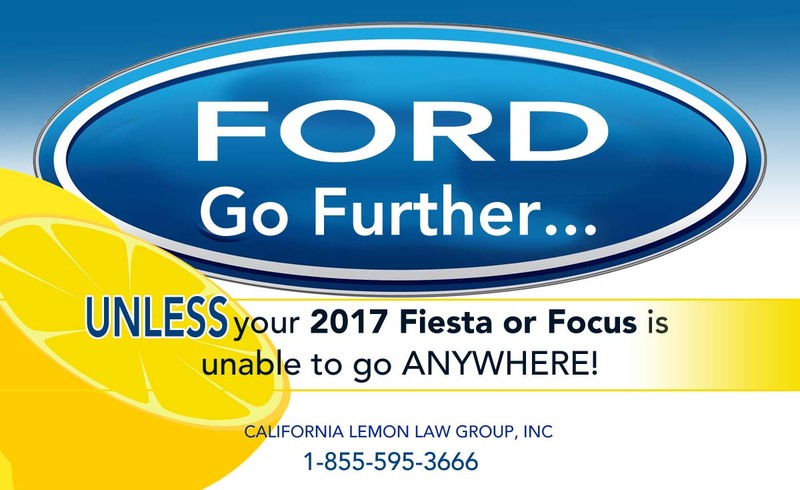 We have extensive experience litigating Ford lemon law cases.